Milagro’s 23rd Día de Muertos production takes inspiration from an imaginary creature unique to Mexican art. ¡Alebrijes! A Día de Muertos Tale is a dream that comes to life through these talented artists. Robi is a physical theatre actor, director, clown, mime and fool that holds an MFA in Ensemble-Based Physical Theatre from Dell’Arte International and a BA in Drama from the University of Puerto Rico. Robi has performed, toured, and lead workshops in Mexico, Venezuela, Puerto Rico, and several cities the U.S. His work is diverse, created through fusion of styles fueled by social justice and change. His passion is to create a physical, dynamic and poetic theatre that connects with people as sports connect with fans. 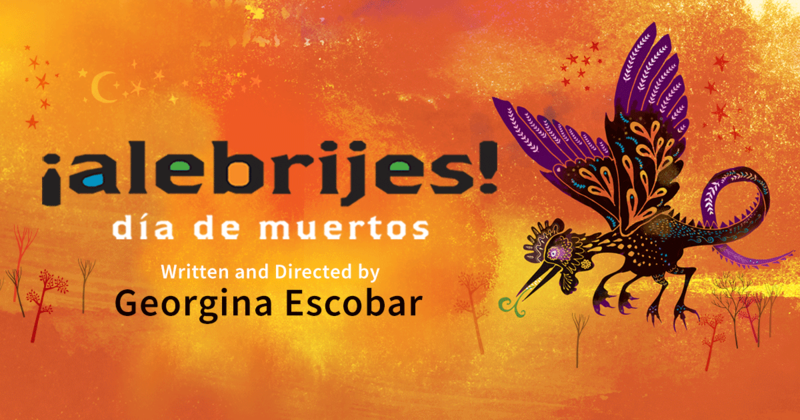 Yesenia is excited to be cast in ¡Alebrijes! Originally from California, Yesenia earned her B.A. in Theatre from Sacramento State University, where she had the wonderful opportunity to play the character of Odessa in Water by the Spoonful and Maritza in Women of Juarez. 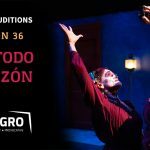 Other previous productions include Zoot Suit, Enslaved, and Electricidad for Teatro Espejo theatre company. Yesenia Lopez is honored to join Milagro and is excited to work alongside such a talented cast and crew. Patricia studied Ballet at La Escuela Nacional de Ballet en el Peru and theatre at la Asociacion de Artistas Aficionados. She is a former Company member of The Peninsula Ballet Theatre in San Francisco. Patricia started dancing Ballroom in 2008 and has competed in Portland, Seattle and Los Angeles. Currently she is a dance student at Espacio Flamenco. Local credits include Grand Hotel and Young Frankenstein at Lakewood Theatre, and five Day of the Dead productions and Watsonville here at Milagro. She thanks Georgina for this opportunity. Geo can be caught acting, directing, writing, improvising all around town. You can catch Simply Maria, or The American Dream at Roosevelt High School in Saint Johns this October directed by your truly. Matthew is super excited to be a part of his first Día de Muertos show with Milagro. Previously at Milagro he got to be a part of Watsonville by Cherrie Moraga and Lydia by Octavio Solis. He graduated from the University of Portland in 2014 and has been acting professionally ever since. He’d like to thank his friends and family for all the love and support they give him. He truly couldn’t do this without them. Thank you so much for coming and please enjoy the show. Tara has previously appeared as Titania in Milagro’s O Romeo. They have also acted with Fox and Beggar Theatre (Angamazad), Portland Actor’s Ensemble (Coriolanus, Midsummer Night’s Dream), Fuse Theatre Ensemble, Original Practice Shakespeare, and others. They teach and direct at the Northwest Children’s Theatre and Rogue Pack Theatre, and have previously directed at St. Mary’s Academy and Magik Theatre of San Antonio, TX. Their play In Toxic was performed at the Fertile Ground Festival in 2016. They produce Resist! the Variety Show, and play music in several local bands. Ciudad Juárez native and New York-based artist Georgina H.L. Escobar’s plays include Then They Forgot About The Rest (Brooklyn Generator 2018), Bi- (Teatro Milagro Tour 2018), Penny Pinball Presents The Beacons (INTAR NewLab Workshop), Sweep (Aurora Theatre 2017), El Muerto Vagabundo (Milagro 2016), The Unbearable Likeness of Jones… (Dixon Place, Readings: The Flea, The Movement Theatre Company), Ash Tree (Duke City Repertory 2012), and collaborations on A Ribbon About A Bomb (Exquisite Corpse Company), Quixote: On the Conquest of Self, (Writers Theatre), among others. She’s written and directed for and with Milagro, New York Children’s Theatre, the Lincoln Center Theater Directors Lab, Clubbed Thumb Emerging Writers Group, and at Marfa Live Arts, the MacDowell Colony and the Fornés Writing Workshop. She’s proud recipient of a Kennedy Center National Theatre for Young Audiences Award, and an Outstanding Service to Women on the Border Award from the sister cities, Juarez and El Paso. Jessica is an apparel artist who has worked on dozens of theatrical production, favorite credits include: (PAC), One Flea Spare (Shaking the Tree), Road to Mecca (Profile Theatre), Seven Guitars (ART), As You Like It (Portland Shakespeare Project), The Pride (Defunkt), and Three Sisters (Northwest Classical Theatre Collaborative). She also designs for dance, film, and special events. Her dresses have been seen in Martha Stewart Weddings and have won awards at The Red Dress Benefit Gala. She holds B.S.A.s in painting and printmaking as well as in apparel design. John is an ex-pat Seattlite, where he designed sound for shows at Arouet, ArtsWest, Driftwood Players, Latino Theatre Projects, Play Factory, Playwrights Theatre, Redwood Theatre, and Theatre 9/12. His music appears on dozens of albums and compilations as well as in television, film, and video games. He is excited to be back at Milagro. Sam’s favorite stage management credits include The Foreigner at Enlightened Theatrics, The 39 Steps at Clackamas Repertory Theatre, and Tartuffe at Post 5 Theatre. Sam also works as an actor, and some favorite roles include Petruchio in The Taming of the Shrew, Baron Tuzenbach in Three Sisters, Scrooge in A Christmas Carol, and Edward Ferrars in Sense and Sensibility. Nelda Reyes, director, actress and educator specialized in physical theatre and in Latin American and Mexican cultural expressions. She holds a MA in Theatre Arts from Portland State University and has studied in the Moscow Art Theatre School at Harvard University, at Casa de Teatro and Teatro Línea de Sombra in Mexico City. She was recently seen at NWCTS (The Tale of the Sleeping Beauty, The Sun Serpent), Profile Theatre (Sam Shepard´s Festival of One Acts ) and The Mermaid Hour at Milagro and appearances in TV series Portlandia and Grimm. Lindsey Bruno is thrilled to be working with Milagro for a second time. She recently participated in the Ingenio reading series as a director, and fell in love with the company. Originally from Los Angeles, Lindsey has worked as a producer and production manager across a number of entertainment fields. A director and performer at heart, Lindsey is so grateful for the chance to direct again after having trained with the Director’s Lab West. You can see her in Stumptown Stage’s upcoming of Jesus Christ Superstar at the Brunish Theatre this spring. ‘Cat’ is a recent graduate of Portland State University (BA, Theater Arts) and a freelance theater artist in Portland, having worn a variety different hats around town including stage hand, board operator, electrician, dresser, assistant stage manager, house manager, director, and actor. They are excited to be a part their second season with Milagro.